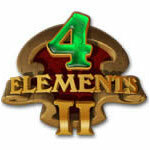 4 Elements II Game - Download and Play Free Version! The chief wizard of the magical realms needs your help! An evil enchantment has cast a broad shadow over the magical lands and has trapped the Elemental Fairies in The Book of Magic! The wizard has been weakened by the power of the spell, the Book of Magic is now scrambled, and only you can make things right again in this enchanting match-3 challenge. Beautifully animated graphics will mesmerize you as you play to set the captive fairies free. Enjoy listening to the soothing soundtrack as you play the mini-games within each match-3 board. But don't let that distract you! You must rescue the fairies and restore The Book of Magic before time runs out! Rescue the Elemental Fairies and become the hero of the magical realms today! 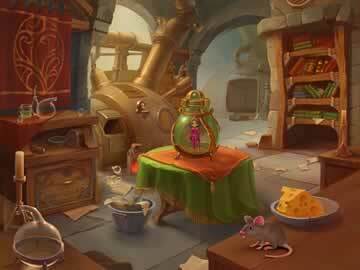 To set the fairies free you must restore their devastated altars by completing a hidden object, puzzle mini-game. When the fairy is released she will guide you to the Book of Magic. Two pages of the book can be viewed on your monitor. One page is filled with jumbled writing. The other is an incomplete illustration of a missing mythical beast. 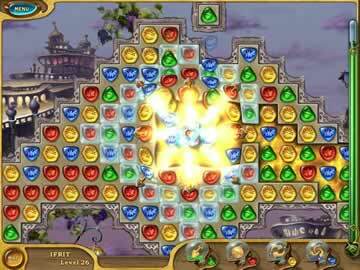 In order to restore the pages to their proper condition you must clear the blocked cells on the match board by linking together three or more gem chips of matching color. The more chips you match the more blocked cells you will clear. This will allow the magic to flow through the board to its final destination! You must complete four boards to unscramble the written page and reveal the missing mythical beast. But your task is not yet finished! You have to make the illustration come to life by conquering the the hidden object mini-game within the now restored illustration. With four chapters per fairy and sixteen illustrations to restore, you can have hours of endless, chain busting fun! Play 4 Elements 2 and set the captives free! Chase the shadow from the realms of magic today by downloading the free trial version today!